With more than 1,200 twisters per year, the United States has been given the dubious title of "world capital of tornadoes." 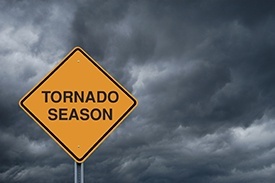 These storms are most common during spring and summer, but they can occur at any time with no advance warning. While no one can predict tornadoes, you can take proactive steps by using these tips to have a safety plan prepared. If you live on the upper floor in one of our luxury Springs communities, find a lower spot where you can go in emergencies. It could be a neighbor's apartment or our clubhouse. If that's not possible, or you don't have time to leave, follow the rest of the rules below. There's a good chance you could be injured by shattered glass. Head to a place deep inside your apartment away from windows, such as the bathroom or a closet. Another option is to get beneath a large, sturdy table. Once you’re settled in your safe place, cover yourself with a sheet, blanket, pillows or any item that can provide protection against airborne debris. When leaving your apartment after the tornado, be on the lookout for fallen trees and branches, downed power lines and other potential hazards. Be sure to document any damage to your possessions in case of a renter’s insurance claim. Our Springs team will handle any damage to your apartment home's structure. Safety and well-being of our residents is our top priority. Stop by and talk to our friendly on-site management team if you have any questions about emergency procedures for tornadoes or other situations.